A surgically acquired opening in the upper jaw and/or hard palate creates unintelligible, hypernasal speech. Additionally, it allows solid and liquid foods to escape into the nose and sinuses. 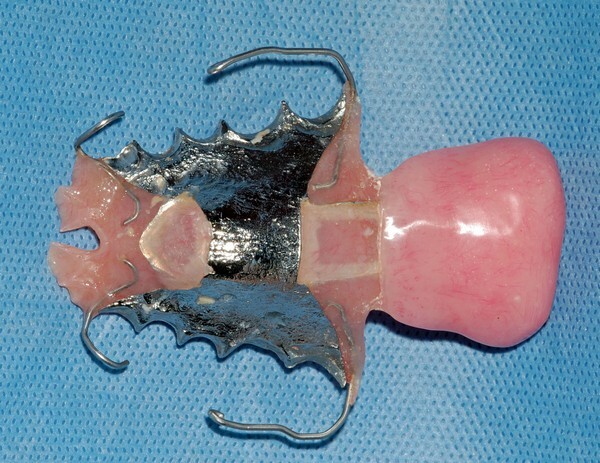 Fabrication of a series of obturator prostheses (surgical, interim, definitive) can effectively treat these problems. The surgical obturator is inserted at the time of tumor resection and modified for several weeks. The interim obturator is more hygienic and designed to be modified for several months to accommodated tissue healing changes. The definitive obturator is fabricated when the associated tissues are stable and well healed. Often the tumor resection will involve the soft palate as well as the hard palate. Less frequently the soft palate only is involved. The soft palate’s function is to modulate airflow for optimal speech. Additionally, it helps direct food and liquids to the pharynx. A speech bulb or speech aid prosthesis re-establishes intelligible speech and normal swallowing. An anatomically intact palate that is non-functional results in hypernasal, unintelligible speech. There may also be escape of foods and liquids into the nose. The most common etiologies of the soft palate paralysis include: ALS, stroke and damage from radiation therapy. A palatal lift prosthesis is used to treat this condition. It lifts the soft palate superiorly and laterally to optimized its relationship to the muscles of the pharynx (throat) during the functions of speech and swallowing. Fortunately, they are less common now that combined chemo/radiation therapy has become the primary treatment modality for large cancers of the tongue, tonsils, and throat. The main etiologies are: tumors of the lower jaw, ostreoradionecrosis and trauma. Small defects can be relatively easy to treat. Large continuity defects require a sophisticated multidisciplinary surgical and restorative/rehabilitative treatment teams. Oral cancer treatments may result in problems with swallowing and speech articulation secondary to compromised tongue function. Surgical alterations and/or neurologic damage from radiation are the causative factors. Neurologic damages from ALS also affects the tongue. Both restricted mobility and loss of structure can prevent the tongue from moving food from the oral cavity to the throat during swallowing. Additionally, speech articulation can be affected because the tongue is no longer able to contact the hard palate in the usual locations during speech sound production. A palatal augmentation prosthesis can improve these problems. It works by prosthetically lowering the hard palate which creates a more functional interaction with the tongue during speech and swallowing.